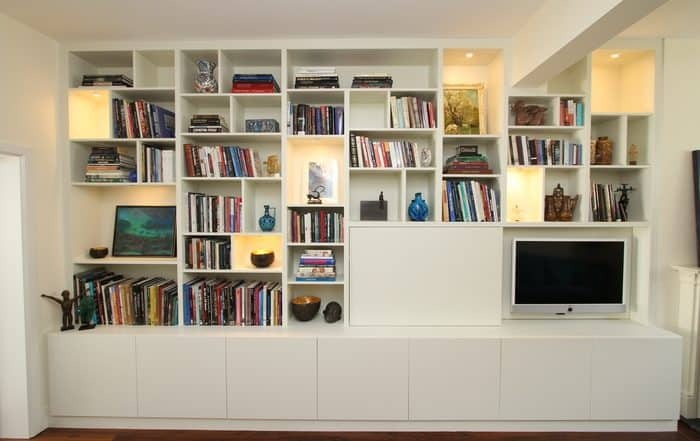 Home/Bespoke bookcases, Bespoke fitted furniture, Bookcases, Eco Fitted Furniture, Furniture, Made to measure Shelving, Modern Fitted Furniture, Top Story/What is bespoke furniture? Bespoke furniture is simply furniture that has been made to measure according to what you want to use it for and how you want it to look. 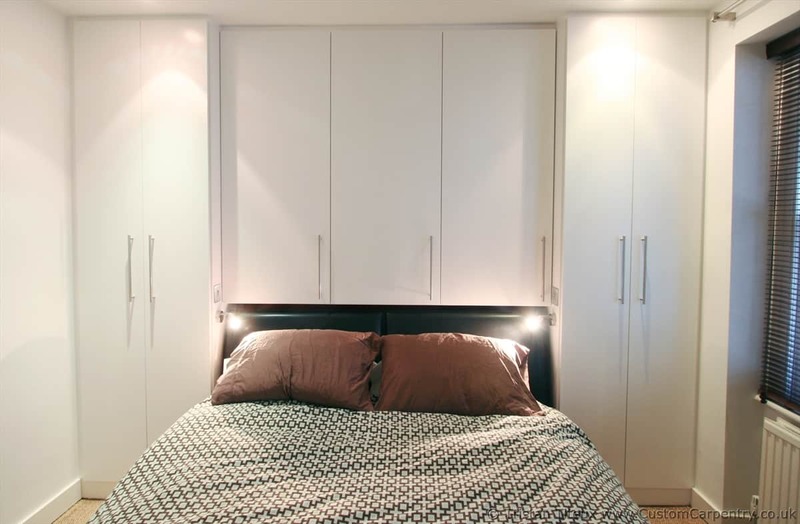 So for example if you want a wardrobe that is a particular size and configuration of whatever shelves, hanging and drawers at the exact size you want, then if you commission bespoke furniture you can have it exactly how you want it. So, you might have a wall that has a chimney in the middle and you might want to fit storage in the exact space that you have on both sides without wasting any space, then bespoke fitted furniture will do just that. Bespoke furniture also means that you can have the wood you like, the thickness you want, the colours you want it painted in, you can choose what handles or lights you want. The fantasy starts in your mind and you can create a rough sketch, show it to a qualified custom furniture company and they will be able to talk you through it and advise you as to how best to make it a reality. See how to prepare drawings for a quote by clicking here. Talking of custom furniture, bespoke, made to measure, fitted, built-in and tailor made are all words often seen together. 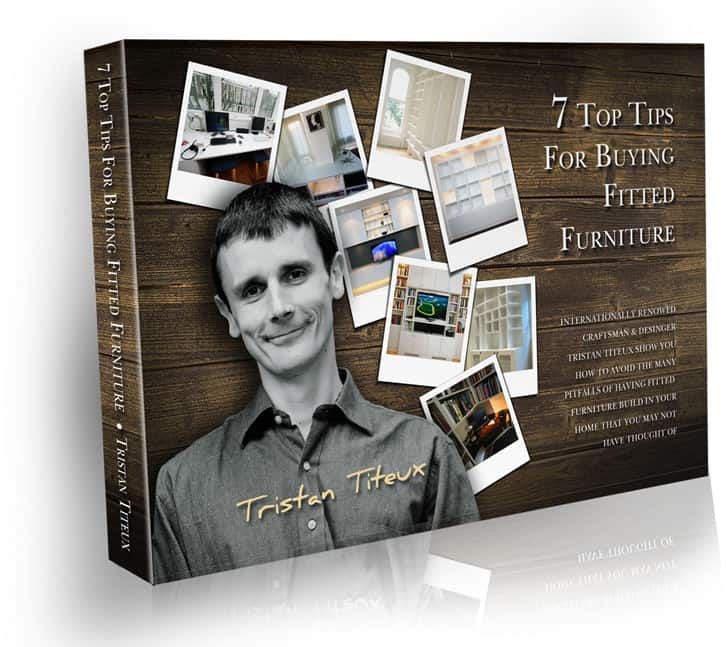 Because your furniture is bespoke, a good company will give you computer drawn, to scale plans of your dream bespoke furniture before you go ahead and build it, this is crucial, you can’t miss this step if you hope to get exactly what you want. 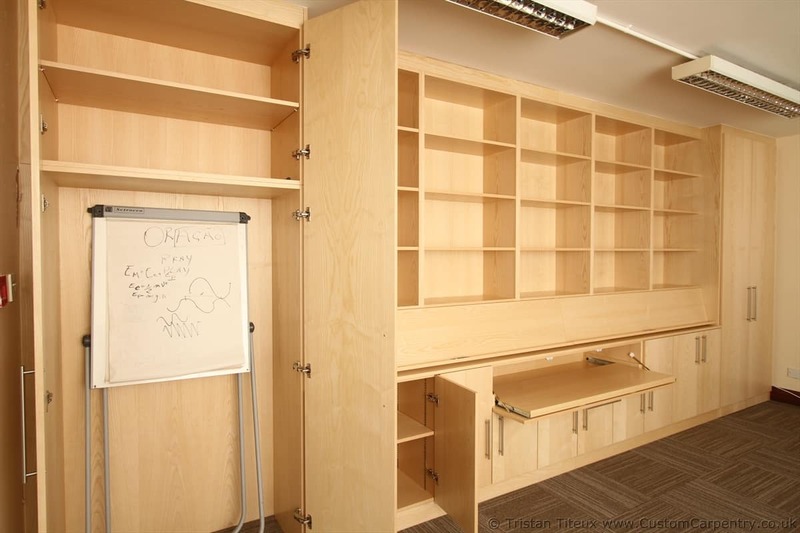 Below are examples of bespoke fitted furniture. 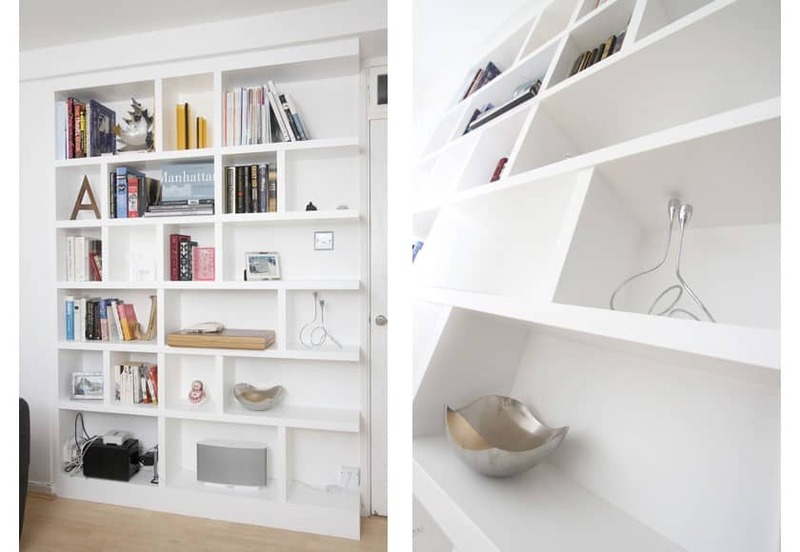 This bookcase covers two walls floor to ceiling, wall to wall and over two doors. 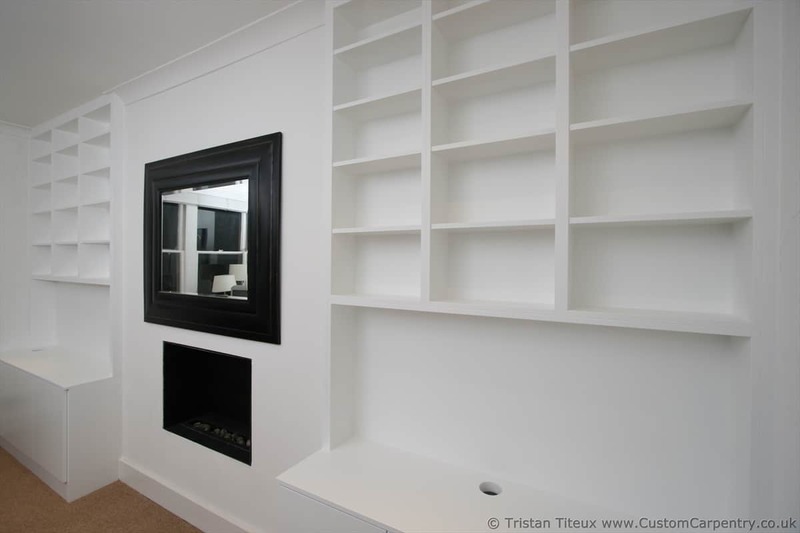 These bespoke alcove units fit seamlessly in two bookcases. 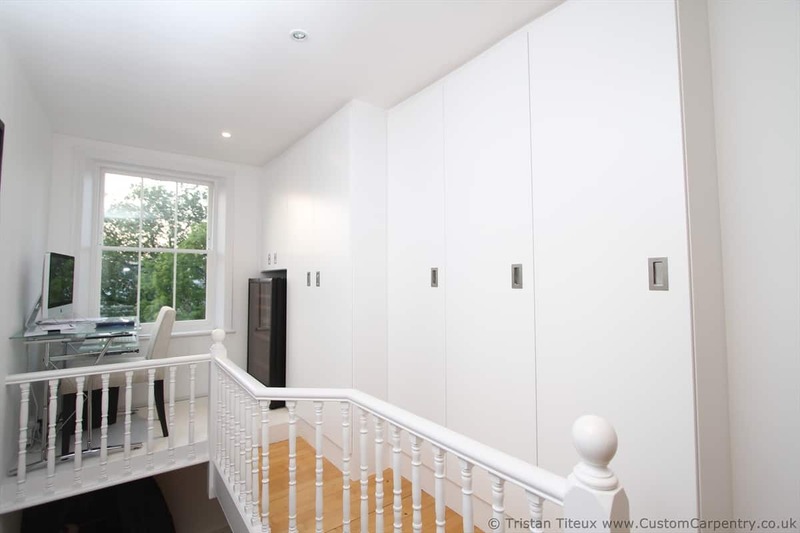 The thing with bespoke fitted furniture is that it looks very neat because there are no gaps between wall and furniture. 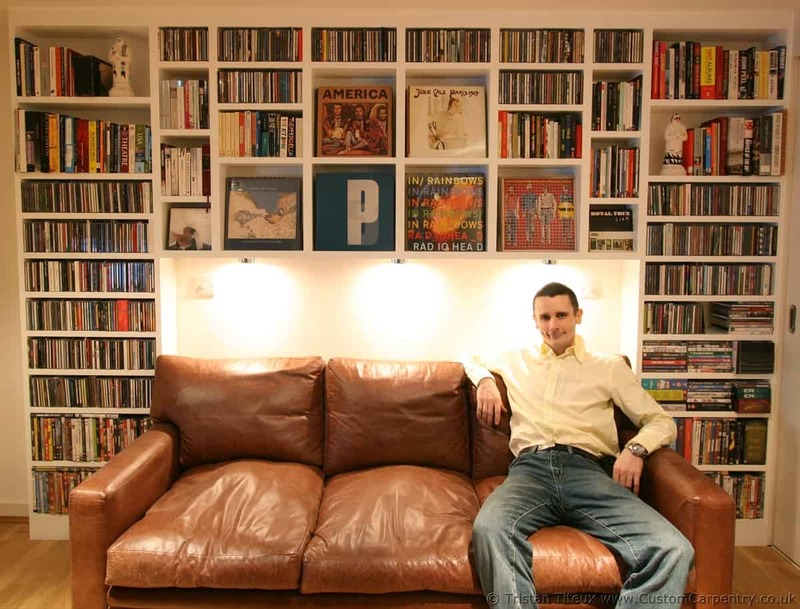 This bespoke bookcase was built to fit around a sofa and to house a collection of cd’s, records and books, because the customer wanted it to be shallow, I put the records sideways, this makes a living movable piece of art. Imagine you are having a party, and you change the artwork of the records to suit! This unit has neat shelving for cd’s and dvd’s in in the mini tunnel around the doorway. 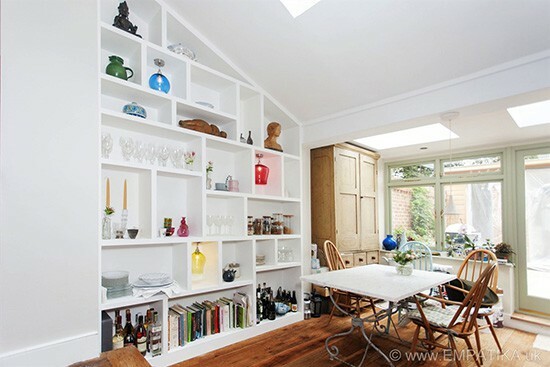 This bespoke furniture was built in a very tricky space to hold lots of storage including filling drawers, golf kit etc. 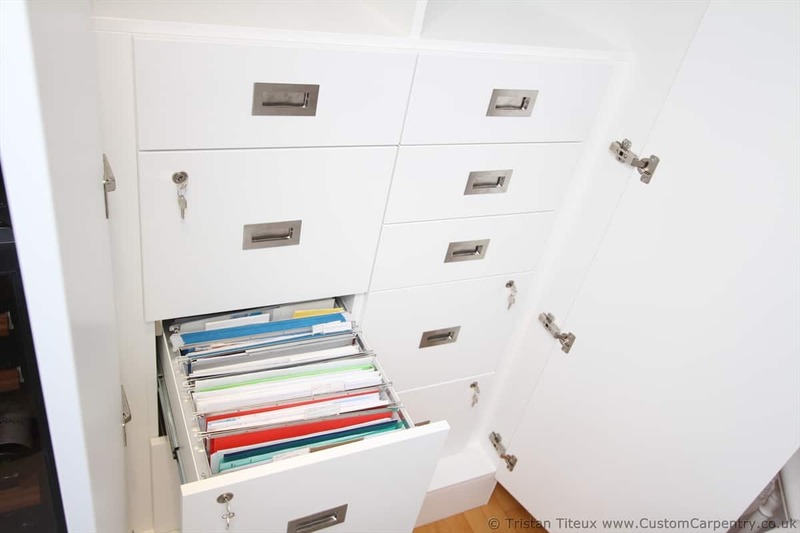 These are the drawers hidden behind the unit above, all drawers are hidden behind doors and some have locks. 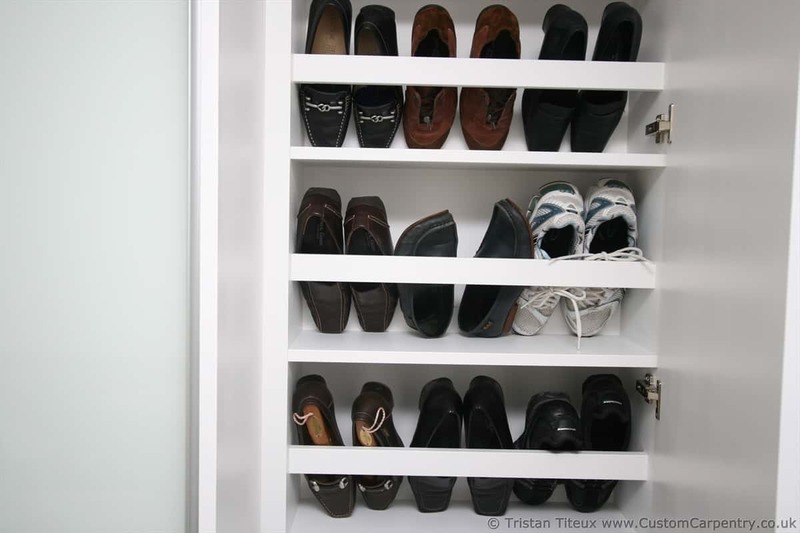 This shoe cupboard was designed to fit in a very shallow space. This bespoke Ash veneered unit is made for a church to fit a pull out keyboard in the centre for organist to practise, the two end cupboards have chairs and white boards, they go all the way to the floor so that the items don’t have to be lifted in but just dragged into the cupboard. When the doors are shut you would not know that there isn’t a base. 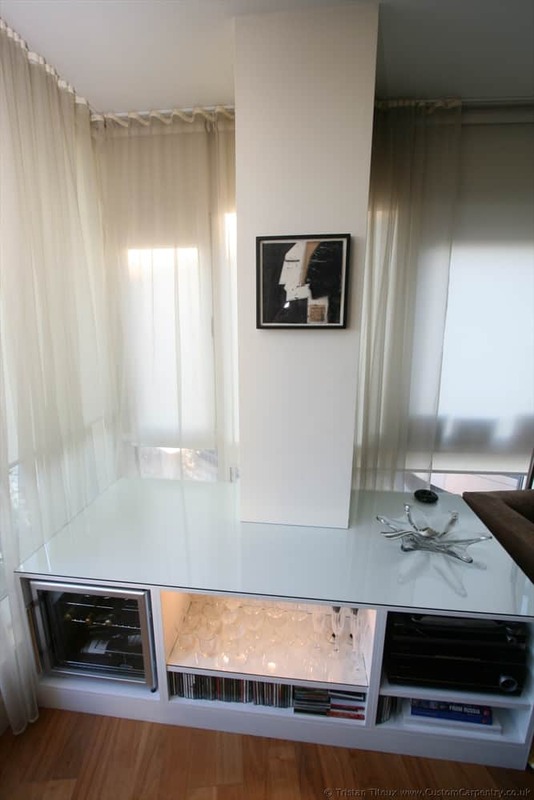 This low level unit was built to fit angles that where not square in any direction and around a post, the top has a glass piece, the inside houses mini cooler, glasses with lights to bring a bit of live down there, and a stereo and cd’s, all the ingredients for a great party! The tall section is much deeper and houses hanging clothes, the shallow section folded clothes and shoes at the end. From the front it all looks clean and simple, just want you want in a bedroom to relax. 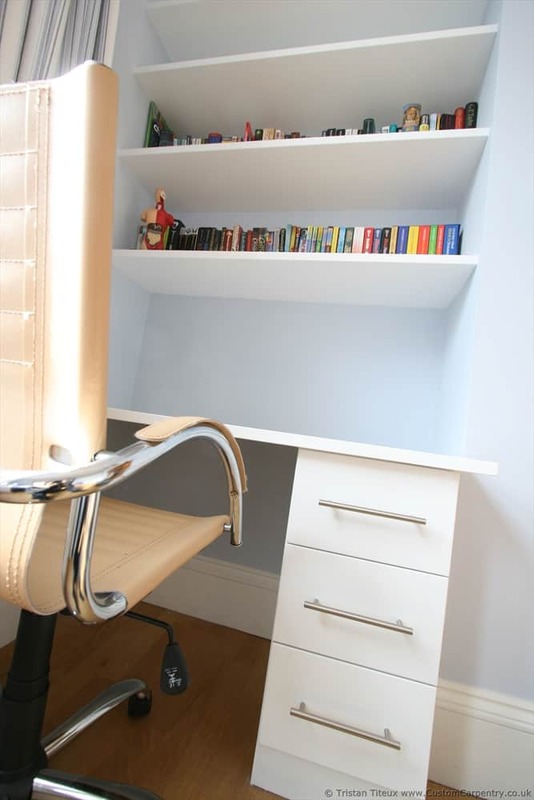 This desk fits perfectly in an existing alcove. 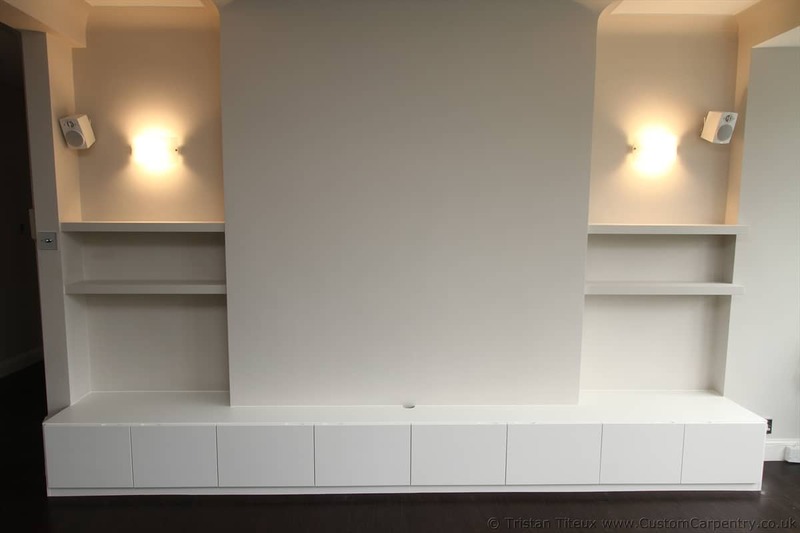 This bespoke unit fits in two separate alcoves and brings them together and smooth out the gaps to make it look more streamlined rather than two indented sections in the wall. 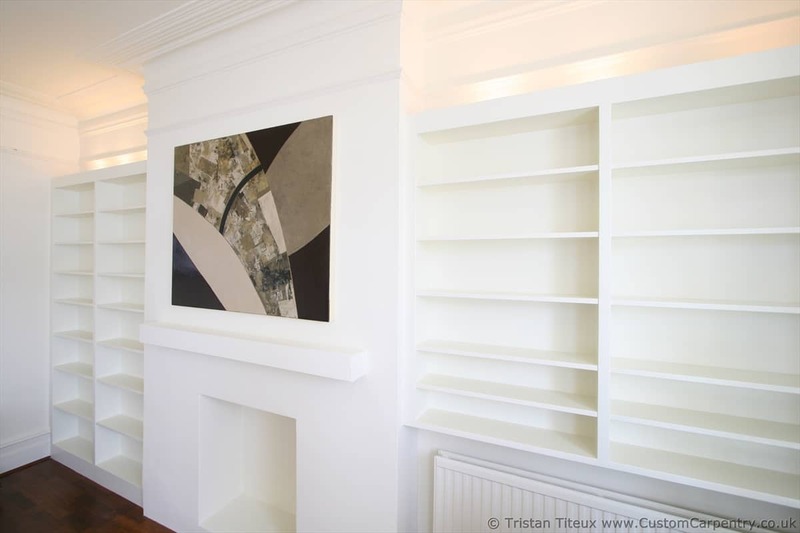 Bespoke bookcase in two alcoves, above on radiator and with lights shining towards ceiling for a nice soft light. Bespoke furniture makes the most of every last millimetre of space, this covers a wall perfectly and hides an alcove on the right. 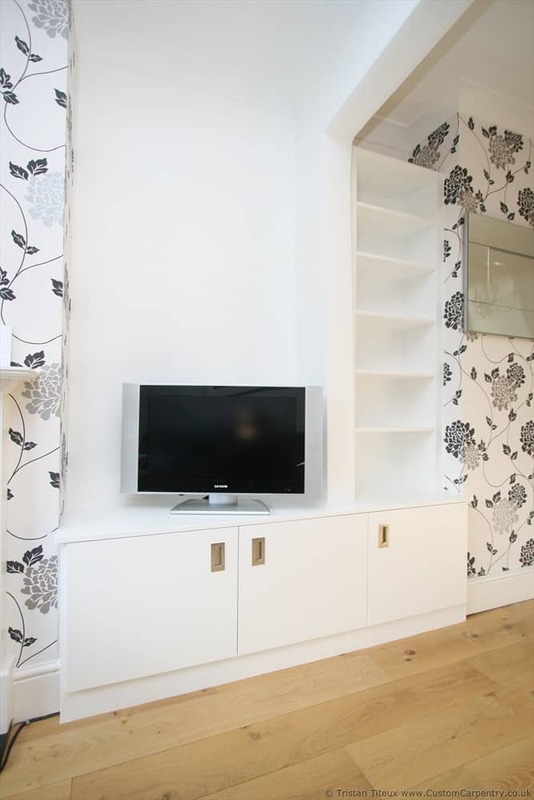 This bespoke low level media unit spans two alcoves and the chimney breast. It looks super slick when the unit runs all the way across like that. 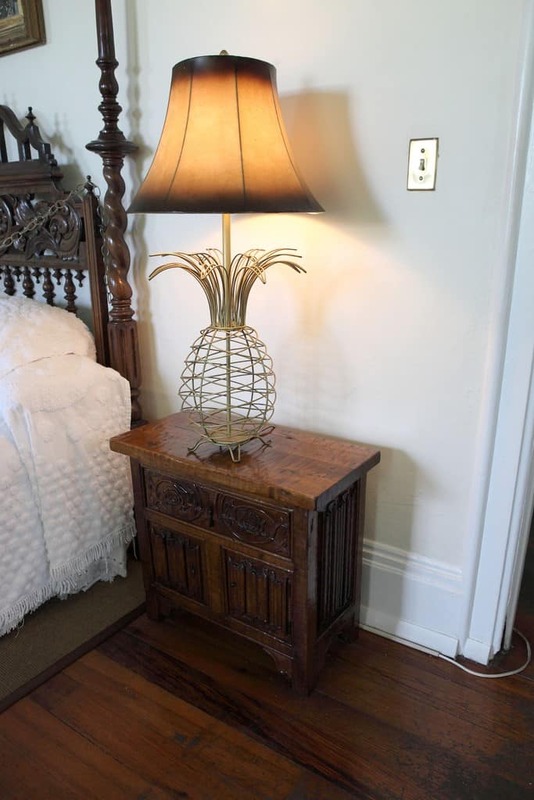 See more bespoke furniture here.